Behind-the-scenes documentary following director John Moore during the production of "Flight of the Phoenix" in Namibia. 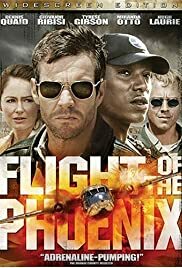 Pretty interesting look behind the scenes of the Flight of the Phoenix remake. The first thing that really struck me about this documentary was how much of an, ah, emotional man John Moore is. There are some great looks behind the scenes of the making of the movie, which are almost always overshadowed by the occasional tempter tantrums the John Moore throws. Granted, he's in the middle of making a multi-million dollar movie on the other side of the planet and in the middle of the desert, but it really seemed to me like he was the only person getting upset all the time. There is a funny scene where Giovanni Ribisi is taken away from the set to give an interview for Entertainment Tonight or something, and he has to introduce himself four or five times for all of the different channels that will be playing the interview. Most of the main actors give interviews, impromptu or not, in this documentary, and I especially like that it spends very little time showing footage from the final film, concentrating more on footage taken of the actual shooting of the movie, not the results of it, and that is how good supplemental documentaries are made. And like most documentaries included with the DVDs of less than great movies, this one actually made me like the movie more, because it gives insights not only into the intentions of the movie but the experiences of the cast and crew in making it, which always helps me identify. Not bad.